A Everywhere! I live and breathe interior design. It’s just on my mind 24/7 so everything I see and do gives me ideas for projects big and small. Q What do you think the most important skill is that you possess as an interior designer? A Aside from the obvious being creativity, it’s got to be problem solving. Schemes are easy to dream up but not every room can accommodate them and sometimes hurdles can crop up along the way. I do a lot of thinking outside the box, but there’s almost always a solution! Q Who would be your dream client? A Kids make great clients – they usually love bold bright designs and their parents are usually prepared to step further outside their comfort zones than they are with their own front room! Q What do you think the biggest mistake people make when decorating their home? A Ooooo too many to mention! Playing it safe. Often people will “window shop” the colour samples before settling for a neutral tone because they don’t want to regret a bold colour choice. I say, it’s only paint it’s not permanent and besides there’s plenty of grey and drab outside our front doors thanks to the good old English climate! If colour makes you happy then break the mould! Attempting to create “space” by pushing all furniture to the far corners of the room. Better to fill the space and create a cohesive and inviting setting. Break up that floor space with a few layered rugs and place a coffee table dressed with fresh blooms to create a focal point. Spending too much money! It’s easier than you’d think to put together a magazine worthy scheme without breaking the bank! There are lots of great high street alternatives to high end furnishings- you just need to be prepared to shop around. Q What do you think are the top trends in the interior design world at the moment? A Pantone colour gurus have just recently announced Ultraviolet as their colour of the year 2018 so I’d expect to see lots of deep purples working their way into colour schemes across the globe. This colour trend also lends itself perfectly to textured velvets which also seem to be sweeping across the design scene. Metallics are still bang on trend, but to be ahead of your game move away from copper in favour of gold and brass finishes. Marble was big in 2017, but I think retro Terazzo is set to make a comeback and I for one absolutely LOVE it! Q What is your personal favourite look, when it comes to interior design? A I have quite an eclectic sense of style: I love mixing old with new, adding pops of colour to muted schemes and accessorising with interesting conversational items. That said I don’t think I’m a “wacky” designer! I also absolutely love stripped back Scandinavian, mid-century design. Q What one thing can people do that will instantly update the look of a room or their home? A Paint, scatter cushions, throws, rugs! OK, so that’s four, but all are worthwhile to create a big impact! Q You are currently working part time as a teacher, bringing up two little girls and launching your new interior design business… how do you manage to juggle it all? A Lots of coffee and a very wonderful and supportive husband! I’m working very long hours at the moment, but nothing ventured, nothing gained. My number one goal is to be an inspiration to my girls. If you want something, break down the barriers and go get it! 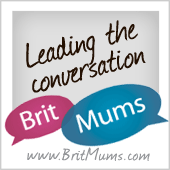 Q What’s your top tip for working mothers? A Know who your support networks are and don’t be afraid to lean on them from time to time. Enjoy the little moments with family and always find time in the day to give thanks together. Q Your daughters have the most beautiful rooms… What’s the favourite thing they’ve ever had done to their room? A Thank you! 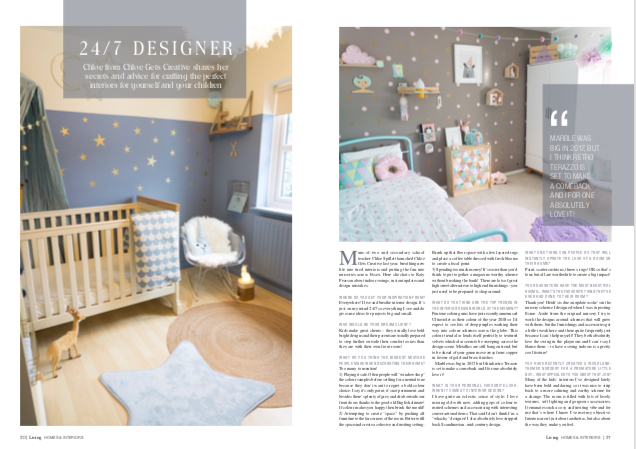 Heidi’s is due an update as she’s in the nursery scheme I designed when I was expecting Esme. Aside from the original nursery I try to work the designs around schemes that will grow with them, but the furnishings and accessories get a little tweak here and there quite frequently just because I can’t help myself! They both absolutely love the swing in the playroom and I can’t say I blame them – to have a swing indoors is a pretty cool feature! Q You have recently created a woodland-themed nursery for a premature little boy… what appealed to you about that job? A Many of the kids’ interiors I’ve designed lately have been bold and daring, so it was nice to strip back to a more calming and earthy scheme for a change. The room is filled with lots of lovely textures, soft lighting and gorgeous accessories. It emanates such a cosy and inviting vibe and for me that’s where I know I’ve met my objective. Interiors aren’t just about aesthetics, but also about they way they make you feel. Q What was the hardest bit of it? A Actually, for the most part it was quite plain sailing. There were lots of different tones of wood in the room to begin with so I guess it was challenging to bring continuity to the scheme. I worked around it by wrapping the main wall colour around the door, window sill, architrave and skirting boards to give a seamless finish. Q And your favourite bit? A The cream upper third of the wall and ceiling has glitter mixed into the paint. It’s really subtle, but when the light catches the walls it’s looks really magical! I’m not usually a glittery person but it did make me wonder where I could work it into my own home- it’d look amazing in a bathroom! Q What do you enjoy most about interior designing? A Reactions! I love how beautiful spaces can have the power to uplift spirits. When my clients tell me they’ve all piled into one room because they love the way it makes them feel, that’s real job satisfaction! Its cliché, but breathing new life into tired tatty and neglected spaces is what I live for! An extract from this feature was published in the February issue of Essex Living.